Tayler was an awesome sales man and very honest. I got a great buy and happy with the vehicle I bought. I give them a 10/10. AWESOME!!! Happy with the service we got! Thank you! We have bought our last 3 vehicles from Teutopolis Auto Sales. They have great customer service and always go above and belong to find what we want.. I highly recommend them!! 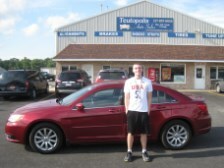 My son and I had a great experience working with Craig Jackman at Teutopolis Auto Sales. He was a straight shooter and there were no surprises! Great service Craig Jackman was very helpful making my first new car purchase exactly how buying cars should be couldn't be happier with my new car!